So, you’ve decided that you want to have straight teeth. Good for you! What you don’t want, however, is the appearance and hassle of metal braces and brackets. Whether you are an adult with a professional reputation to consider or a teen who just plain doesn’t like the look of metal braces, you shouldn’t have to compromise. Not to worry, because with Invisalign aligners from Mod Squad Dental in San Diego, CA, you can have braces that are virtually invisible. 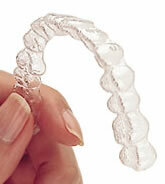 Invisalign aligners are made of clear, PBA-free plastic that fit smoothly and snugly over your teeth. With no sharp wires or brackets, there’s nothing to poke or irritate the inside of your cheeks or your gums. And best of all, Invisalign—as the name implies—are all but invisible to people who see you when you are wearing them. First, you and your dentist at Mod Squad Dental will meet to discuss your smile goals and how Invisalign can help. Then, your dentist will develop a treatment plan based on x-rays, pictures and an impression of your teeth. This plan will allow you to see how your teeth will move during the course of treatment and even how your teeth will look when the plan is completed. Of course, your role in the plan is to wear your custom-designed Invisalign aligners for a majority of the day. You’ll remove them only to eat or to brush and floss your teeth. Approximately every two weeks you’ll begin wearing a new set of aligners. Gradually, as you progress through the sets, you’ll begin to see your teeth move into their proper position. Regular check-ups at Mod Squad Dental will be scheduled, and soon you’ll have the smile you’ve always wanted! If you would like to learn more about Invisalign aligners, then call the Mod Squad Dental office today in San Diego, CA. Our office also conveniently serves patients in Scripps Ranch, Rancho Pensaquitas, Poway and the surrounding areas.